I bought the Dx0 Nik Plugins v1.1 for £30 during their Black Friday sale but I can confirm that Viveza in new version doesn't work with Affinity Photo 1.6.5.123 or the 1.7 Beta. I get same washed up colours as stated by others in this thread. In any case I ran some tests and this is what I found. Running the Viveza plugin from Affinity Photo - pictures from my Nikon D7000 all affected - NEF, JPEG. With my Canon S50 - CRW affected but JPEG ok. NOTE - When I magnify view to 100% in Viveza2 colours are ok in main viewer but not in Navigator. This points to image size as my Canon S50 produces smaller JPEG images. I tried from other editors i.e. Adobe PS6 and Nikon View NX-i/Captur NX-D, Viveza works as expected. Would be great if Serif can fix this as this one plugin is stoping me from ditching the other editors from my work flow. By the way for anyone interested my current workflow is to use ViewNX-i then run Capture NX-D for RAW. Convert to tiff 16bit and return to ViewNX-i. This process retains the non distructive changes made to my RAW file. I then run Nik plugins from ViewNX-i on the newly created tiff file. Afterwards I go into Affinity for remainder but lately I have been using Adobe PS6 because of Viveza issue. I really want to go from Capture NX-D into Affinity and use Nik plugins from there. A different approach to this problem is to use another app to develop your RAW file and from within that app run Viveza. 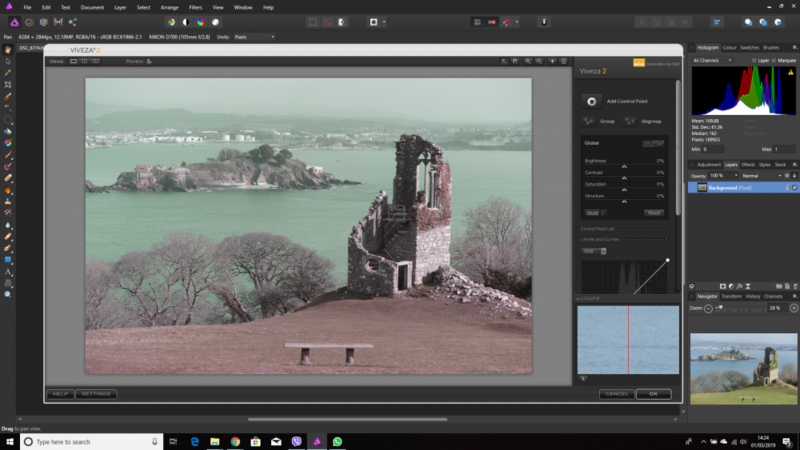 I am currently using CaptureNX-D v1.5.1 for my RAW development and use the Colour Control Points within the retouch tab. This is same U-Point technology as employed in Viveza but there is one missing control slider "Structure". The advantage using the control points in NX-D is that the NEF file is kept in a non-distructive state. From within NX-D I can still "open with" Viveza this edited NEF file. NX-D will convert the NEF file into a TIFF and open in Viveza. Once finished in Viveza the TIFF file is saved in PICTURES directory. You can then open in Affinity Photo. Opening in Viveza Stand-alone is final option. I just took up DxO's April promo offer on Photolab2 promo and I think I have my perfect workflow. I was reluctant to fork out more on top of Nik Collection but I don't think my investment is wasted. I got Photolab2 Elite for less then half the retail price. 1. Use Photolab2 photo library and process my RAW files. RAW development tools like CLEARVIEW, PRIME and Local Adjustments are awsom. No need for Viveza as Local adjustments utilises U-Point technology and covers what Viveza would have done. 2. Export into Affinity using sidecar feature. Photolab will convert to TIF and open in Affinity. 3. Run Nik Collection filters within Affinity as required bar Viveza. 4. Carry out other image enhancements/repairs in Affinity using layers. So far Photolab2 and Affinity Photo (WIN) are working very well together.